Was playing with my headphones in, shooting my guns, and being shot at--the volume is fine. Then a CV dive bomber squad attacks me and the volume is so ****ing loud I have to rip out my headphones from the pain it caused. Ridiculous. 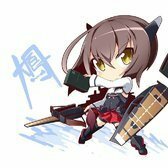 Wait until an akizuki decides it wants to camp behind an island and farm some damage off of you. You'll run away just to escape the constant sound of shells hitting your ship.